The Paris Hotel and Casino in Las Vegas is a modern entertainment hub, inspired by the sights of the French capital. The eye-catching highlight here is the mini Eiffel Tower which is about a 3rd the height of the original and stands proudly a the front of the hotel overlooking the Las Vegas strip. Also outside at the hotel, you’ll find a mini Arc de Triomphe and the outside of the hotel is shaped like some of the traditional Parisian buildings like the Paris Opera House. The familiar hot air balloon landmark is here too. Inside the hotel there are restaurants and shops to the rear of the Casino down a fake Parisian street which is well worth visiting. You could pop into the patisserie for a pastry perhaps! Visiting the tower is definitely worth the cost involved. 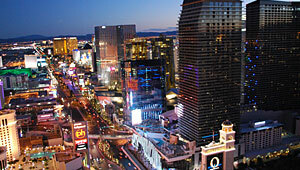 There are some magnificent views of the strip and it’s far cheaper than a helicopter ride! The trip up the mini Eiffel tower costs $14 for adults before 7.15pm and £19 after 7.30pm. There are discounts for seniors and children over 5 (2015 prices). The tower operates from 9.30am to 12.30am Monday to Friday and 7.30am to 1am Saturday & Sunday, although there are sometimes restrictions because of the weather. There is a restaurant part of the way up the tower too. For a great view of the tower, consider the Las Vegas Night Strip Helicopter Tour which gets great reviews from those who book it. Paris Hotel & Casino is opposite the Bellagio on the Las Vegas strip. The hotel is open 24 hours a day.